As the NFL kicks off its 2014 season, DISH is adding an ESPN Fantasy Football app that delivers fantasy stats directly to customers’ TV screens. Available on DISH’s Hopper(R) Whole-Home HD DVR this weekend, the new app gives customers the ability to follow their fantasy players’ performance, team’s weekly matchup and league standings in real time – all while watching live or recorded TV. The app will roll out to DISH customers beginning Friday night. 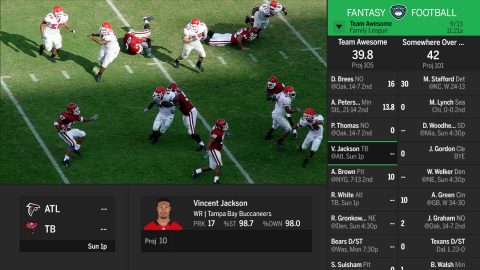 The app’s L-shaped layout – with fantasy data displayed on the bottom and right side of the TV screen – automatically resizes the viewing screen to display fantasy league stats without obstructing the live game. It also features all weekly matchups within a league, bench stats, individual player and defensive team profiles, and NFL teams’ in-progress box scores. Moreover, the app is compatible with multiple ESPN fantasy football leagues, ideal for individuals and households with more than one fantasy team. To get started, customers must create a league at es.pn/ffl, then sign in to the app on the Hopper with their ESPN fantasy football username and password. The app is accessible from any channel by clicking the blue button on the DISH remote and selecting the ESPN Fantasy Football icon. For more information, please visit www.dish.com or call 1-800-333-DISH. DISH Network Corporation (NASDAQ:DISH) , through its subsidiaries, provides approximately 14.053 million pay-TV subscribers, as of June 30, 2014, with the highest quality programming and technology with the most choices at the best value. Subscribers enjoy a high definition line-up with more than 200 national HD channels, the most international channels, and award-winning HD and DVR technology. DISH Network Corporation is a Fortune 250 company. Visit www.dish.com.